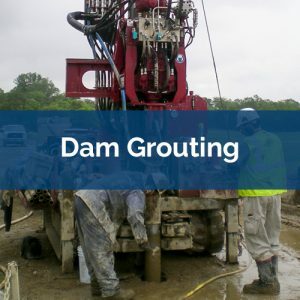 Grouting is a means by which subsurface voids are filled with fluid mixtures. Commonly the fluid mixtures used for grouting are made of cementitious materials mixed with water. Grouting can be used for many application including fracture filling, i.e. permeation grouting, for arresting sinkhole development, and for stabilizing the subsurface for future construction. Low mobility grouting can also be used to fill manmade structures like pipes, tunnels, or mine shafts, i.e. pipe or void grouting, and for ground improvement via compaction of soil, i.e. compaction grouting. Finally, grout can be injected and mixed with the soils at high pressure for the formation of columnar elements of soil-grout, i.e. 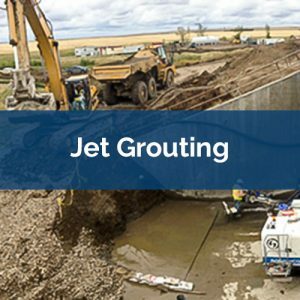 jet grouting. Commonly grouting involves the installation of a hollow casing to the depth of interest. 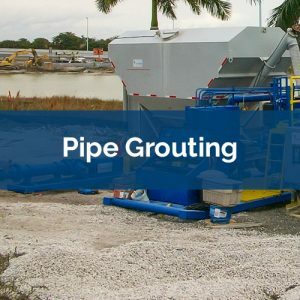 Once the casing has been installed, a grout is injected into the subsurface through the casing as the casing is simultaneously pulled out of the ground. Grout is typically injected until a noticeable increase in pressure is achieved at the surface which indicates that all of the voids have been filled. The principals of Geo-Solutions have been involved in the application of grouting to solve geotechnical and environmental construction problems since the late 1980s. Geo-Solutions provides a range of innovative grouting techniques that can be performed as a stand-alone solution or used in conjunction with soil mixing or slurry trenching to address a variety of challenging subsurface conditions. 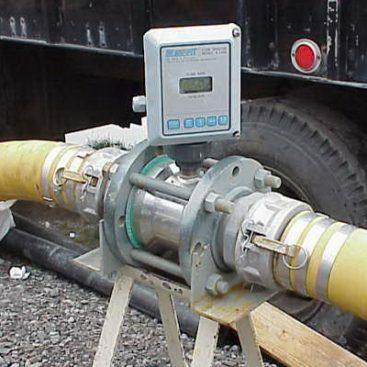 Geo-Solutions employs the use of a computerized system for measuring and monitoring performance in dam foundation grouting projects including recording of: grout flow, pressures, permeability, grout take and mix designs. Geo-Solutions can provide all the supervision, labor, materials, equipment, and supplies needed for your next Pipe Grouting project. Geo-Solutions is no stranger to the stabilization activities needed when jet grouting cement columns and other services. There are many publications written by Geo-Solutions’ Staff and other industry leaders, which focus on detailed technical aspects of Grouting.